US, 1945, 67 minutes, Black-and-white. Ann Savage, Hugh Beaumont, Russell Hicks, Charles D.Brown, Pierre Watkins. 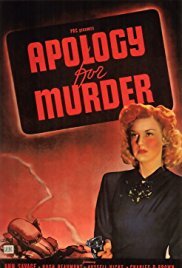 For audiences coming across this brief 1945 film noir, it may seem rather familiar. In fact, it is parallel to Billy Wilder’s Double Indemnity with Barbara Stanwyck, Fred MacMurray? and Edward G.Robinson. While this classic film was based on a novel by James M.Cain, it is said that the screenplay for this film was based on an actual story from the 1930s. Hugh Beaumont portrays a journalist who wants an interview with a millionaire who is reluctant – and encounters an ultra-seductive woman in his office whom he assumes to be the millionaire’s daughter but is, in fact, his wife. He falls for her, badly. And, when he is falling, she manipulates him to murder her husband, promising faithfulness to him. Ann Savage, who had appeared in Detour in a similar role, is a no holds barred villain. Hugh Beaumont is her murderer. The film focuses on the journalist, his behaviour, his emotions, the tangles into which he gets himself, especially as the millionaire’s assistant is accused of the murder and tried. Meanwhile, the journalist’s editor who commissioned the initial piece is suspicious of the wife and her manipulation of an unknown man – and he works his way to find out the truth, asking the journalist to help him. Ultimately, the editor realises who the man is that he is searching for. The journalist himself goes to the wife, sees her with another man using the same seductive tactics, confronts her and there is a mutual shooting. While Double Indemnity is a classic, this B-budget short feature is able to capitalise on the basic narrative and a strong portrayal of the central characters.